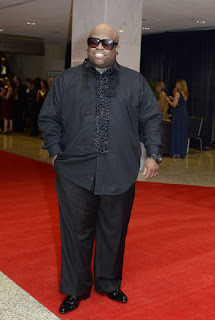 Ceelo was in attendance at the White House Correspondence Dinner. Ceelo really made a career for himself, I always liked his music, to bad the Goodie Mob group didn't make it, I guess spreading your wings do work out if your team ain't as ambitious as you are. Marlon Wayans goofing off at the White House dinner, I think he knows he looks good. Okay not for nothing I really like this couple, President or not they are hot looking, Michelle keeps it fresh and young looking at the White House Correspondence Dinner.